Croissants a l’orange is a perfect make ahead breakfast recipe. Whip it up the night before, stick it in the oven in the morning, and your guests will be singing your praises. 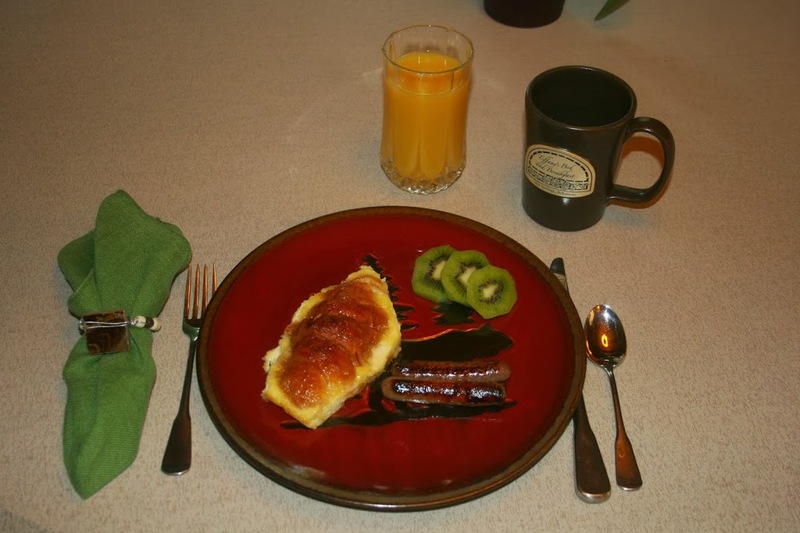 Cut croissants in half lengthwise and place bottom halves in buttered 12″ X 9” oven proof dish. Thin marmalade with orange juice and spoon over each bottom half, saving a little to be used as a glaze. Replace croissant tops. Beat eggs, cream, and almond extract. Pour over top of the croissants. Spoon some thinned marmalade over the top. Soak overnight. Remove from fridge 45 minutes before baking. Bake in a preheated 350 degree F oven for about 25 minutes. Serve hot, and garnish with strawberries and mandarin orange sections. This recipe serves 6, but is easy to adjust for a large crowd or just a couple. Add sausage links or bacon and a fresh fruit for a well rounded breakfast. If cooking and planning and relatives and festivities seem to be getting the best of you, we’ve got one more suggestion. Treat yourself to a weekend getaway at Tiffany’s Bed and Breakfast – as soon as possible!